Today you are in for a treat. I’m going to show you how to make real low carb beignets, the pride of New Orleans. In case you haven’t tried them, beignets (pronounced ben-YAYS) are the New Orleans version of doughnuts. They are squares of yeast bread dough that have been fried in oil and sprinkled with powdered sugar. A couple beignets and a cup of coffee and you are in Mardi Gras heaven. They are incredibly good. And the low carb beignets we are going to make are no different. They just use the Carbquik Baking Mix instead of regular white flour. 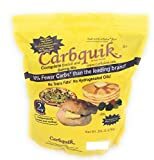 The folks at Carbquik do some sort of voo doo on wheat that makes it low carb. I really do not understand it. But that means that these low carb beignets have less than 1g net carb each, so I’ll take it. Now this recipe does take a good chunk of time to make, since you are making a real yeast bread that needs time to rise. But it’s the perfect weekend brunch project. Your friends and family will shower you with gratitude and Mardi Gras beads. These low carb beignet’s have all the goodness of the original but with less than 1g net net carb each. 1. Mix together water, sugar and yeast in a large bowl. Set aside for 10 minutes until frothy. 2. In a medium sized bowl, mix together egg, granulated sweetener and heavy cream. 3. Add egg mixture to yeast mixture and stir to combine. 4. Add in 2 cups of Carbquik and stir to combine. Add shortening and mix well. 5. Mix in another 2 cups of Carbquik until a dough forms. You should be able to knead the dough. Add more Carbquik until it is kneadable. 6. Sprinkle some Carbquik onto the counter and knead the dough until smooth, about 1 minute. 7. Grease a large bowl. Add the dough to the bowl, then flip the dough so that both sides are coated. Cover with a towel and allow to rise for 1 hour. It will only rise a small amount. 8. Fill a large skillet or dutch oven with 2-3 inches of vegetable or coconut oil. Heat to 350 degrees F.
9. Roll out the dough until it’s somewhere between 1/8 and 1/4 inch thick. Cut into 2 inch x 2 inch squares. 10. Add the squares of dough, 4 at a time, to the skillet and cook until golden. If the beignets don’t immediately float, then the oil is not hot enough. Open one to make sure that they are cooked all the way through. Remove from oil and drain on paper towels. 11. Sprinkle with powdered sweetener and serve warm. **I estimated the amount of oil used as 2 tablespoons in the nutritional info. If you liked these New Orleans donuts, then you might want to try my Powdered, Lemon and Double Chocolate Donuts. Just take the coconut flakes she uses on the outside of the donut and replace them with a low carb powdered sweeter. These were AMAZING! My boyfriend is from New Orleans and he loved them too. Sweet. Glad you guys liked them.